I've been trying to write this post for the last hour, but the internet is a very distracting place. Between responding to emails and searching for everything that pops into my head, I finally just decided to make this post about what I'm currently obsessing over. Cruiser bikes. Again. Every summer I get it in my head that I want one, but I never pull the trigger. After lots searching, I like this Schwinn, for the style, color, and price point. I'm just not sure who would put it together. Of course it wouldn't be complete with out a proper basket. Pineapple necklace. Ever since I spotted it on City Tonic, I've been searching for one to match my price point. This one on Etsy is quite reasonable. TJMaxx. Lately I've been all about their online shop, checking it daily, placing a few orders, and adding a million things to my cart like a crazy lady. Presently I'm debating this throw pillow, and this triangle necklace, previously I ordered this sequined clutch (now sold out) for $10. So much for productivity, but I suppose there is always tomorrow. 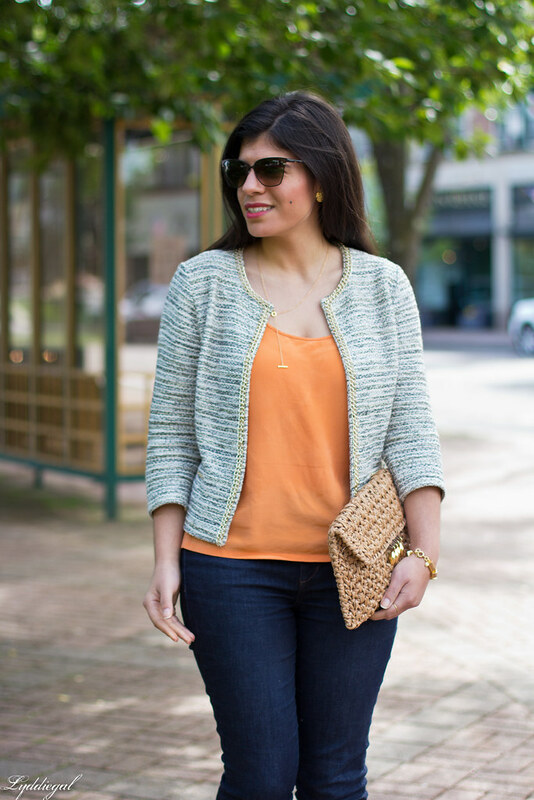 Love the textured blazer and clutch! The internet is definitely distracting. I didn't realize you could shop TJ Maxx online - I never find anything good in store so I'll have to check this out! P.S. I would love it if you joined me tomorrow for my first Link Up party! The distractions of the Internet. Oy how I wish they didn't exist. 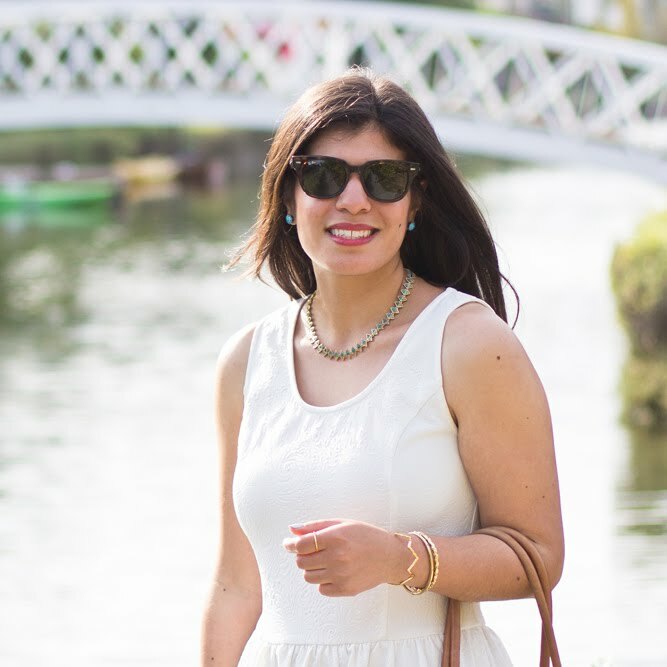 I could have blog posts written for weeks! The internet really is a very distracting place, isn't it? More often than not, my blog post writing goes something like yours has - it's even worse if I don't have a set idea in my head of what to write about, because the search for inspiration always turns into a search through ASOS or whatever online shop I'm cruising at the time :) As for your wishlist, that bike is adorable - perfect for riding and for outfit photos, if you ask me ;) I haven't had a bike for years but I have been thinking about it lately myself. And also, I absolutely have to take the time to tell you how incredibly well you wear orange. Seriously. It is not an easy colour but it looks gorgeous with your dark hair and squinting. That clutch is SO cute! Great look, Lydia! P.S. The internet is a gift and a curse, lol! I am the worst for internet distractions. Seriously. The amount of time I spent each day trawling through online stores and creating wishlists is just downright nutty! Also, please get that Etsy pineapple necklace!!!! It's just so cute. What a marvellous jacket, I always like it when you wear it. I think the pineapple necklace is cute but not that much of a statement. I see I am not the only one who is over thinking the bike. Three years ago I bought 2 baskets for the bike we were going to buy.…and the baskets have begun to rust because we never bought the bikes. God knows if we had bought the bikes, they'd be rusting too. I've been unsubscribing from newsletters, I need to cut my shopping, really. But then I was stalked by Kate Spade and fell again for another bag. Ooh I love that necklace! And it looks great with the orange! I get so distracted and procrastinate so much sometimes when writing blog posts! What a cute pineapple necklace you found! 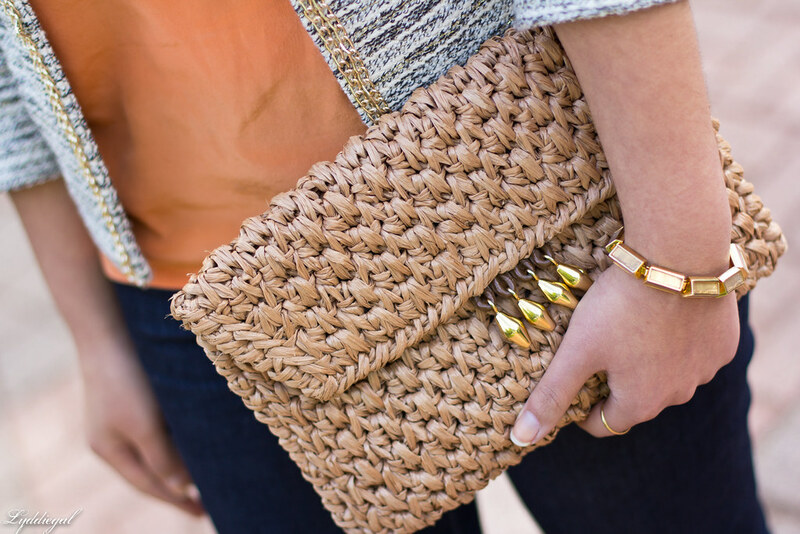 I want a straw clutch like that. What an amazing Goodwill find! I do the same thing! 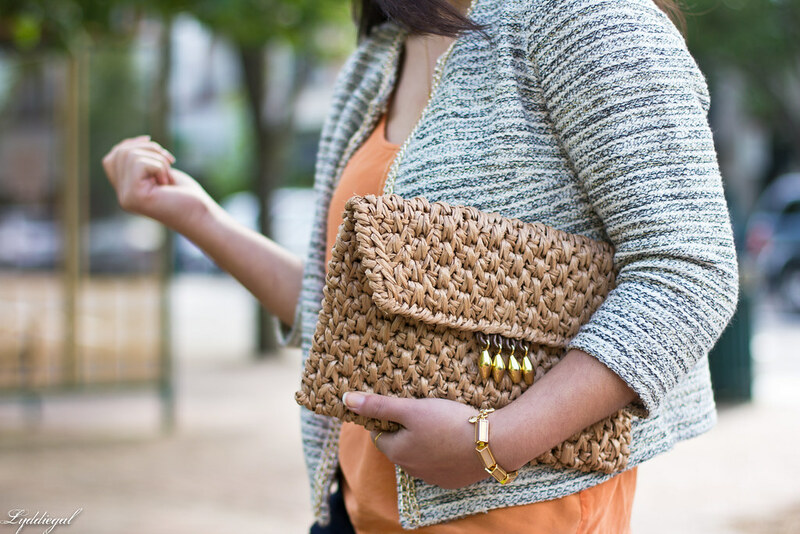 I'm loving your jacket and clutch! What?! When did TJ Maxx get an online store?! Ok, now I'm distracted by that site and will probably not be getting anything done the rest of the night. I did not know TJ Maxx even had an online store - dangerous! 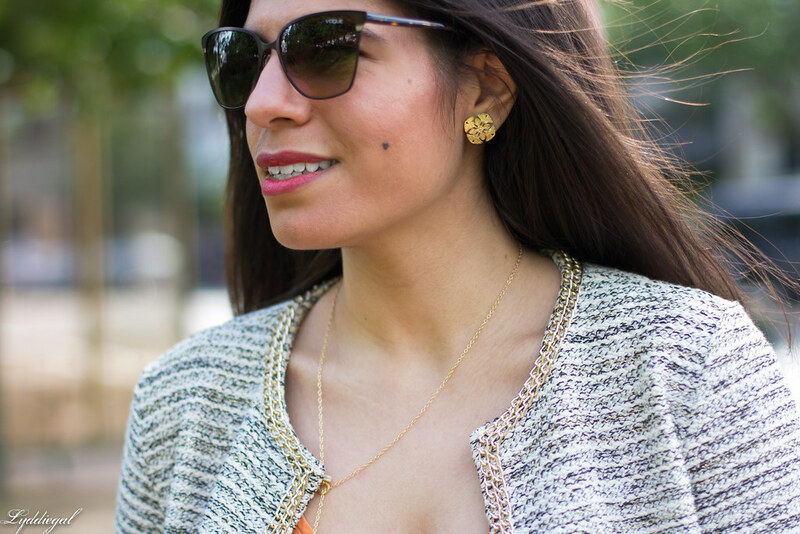 Loving the pretty delicate necklace you are wearing! I'm so in love with this look! The necklace and clutch are perfect additions that really make this a standout look! I feel you on that--I'm not sure if I've gotten any actual work done this morning or not! 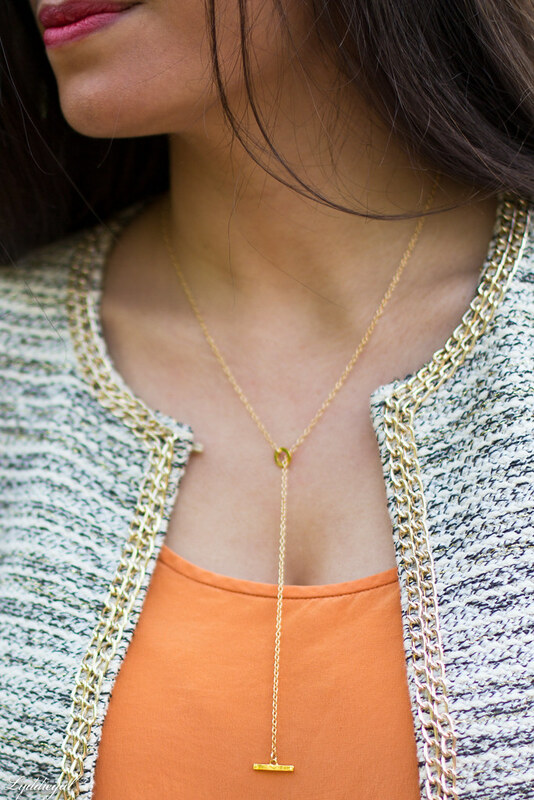 Love this look--the soft orange color is so pretty and I love the delicate lariat necklace!